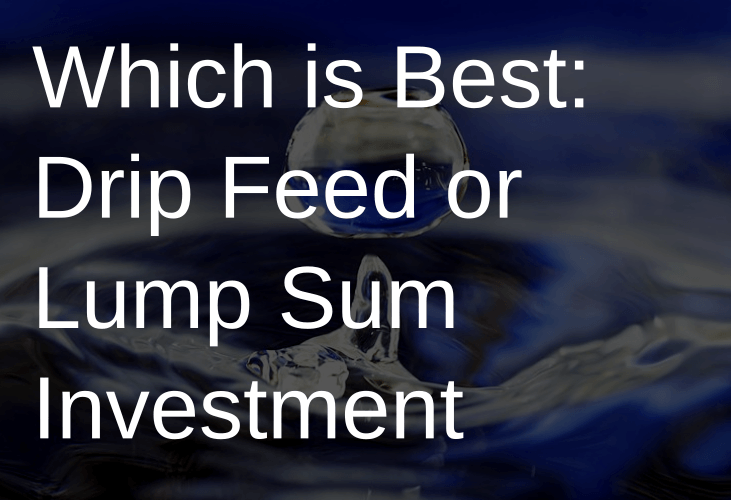 Lump Sum Investing or Drip Feed Investing: Which is Best? If you have a cash lump sum to invest is it best to drip feed that money into your investments or to invest it all in one go? The best strategy depends on something nobody knows: whether markets are going to rise or fall. The truth is that there is no simple winner, but fortunately we can look at the past to work out the probability that each strategy wins. Before looking at "real" markets let's think about some very simple examples. If prices are rising steadily then the obvious solution is to invest your money as soon as possible as a lump sum to gain as much return as possible from compounding effects. For example, an FSCS-guaranteed (but very low interest) savings account at a bank rises steadily in value, and in this case you would deposit your money as a lump sum rather than delay by drip-feeding cash into your savings each month. For example let's say we invest in a single share index with a price that starts at £100 and increases steadily by £1 per month to end at a price of £219 after ten years. Drip Feed: We buy 10 shares in the first month (£1000/£100), 9.90 shares in the second month (£1000/£101) and so on. We end up with 791 shares. The end value of our investment is the final share price of £219 times the number of shares. In the lump sum case this would be worth £262,800 and in the drip feed case just £173,271. Any delay in buying shares meant we could afford less shares so it was best to buy as many shares as possible up-front. If prices are falling then you would be better off delaying your purchases as long as possible so it's best to use drip feed investing. For example let's say we invest in a single share index with a price that starts at £100 and decreases steadily by £0.50 per month to end at a price of £40.50 after ten years. Drip Feed: We buy 10 shares in the first month (£1000/£100), 10.05 shares in the second month (£1000/£99.50) and so on. We end up with 1825 shares. The end value of our investment is the final share price of £40.50 times the number of shares. In the lump sum case this would be worth £48,600 and in the drip feed case £73,917. By delaying our share purchases we could buy more shares so it was best to drip-feed our purchases. If prices are constant then lump sum and drip feed investing give the same return. But what if prices wobble up and down around some fixed value and don't drift up and down long-term? In market parlance this wobbling is called volatility. It turns out that timing is all-important. 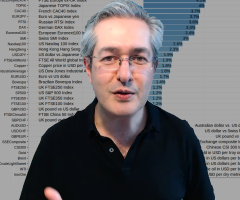 If we buy our lump sum at the top of the cycle we would have been better off drip feeding. If we buy at the bottom of the cycle lump sum investing is better. Let's say the price wobbles around £100, sometimes reaching £110 and sometimes falling to £90. If the price starts off low, as shown in the graph below, then we manage to get a good deal when investing our lump sum and buy 1333 shares which end up being worth £120,000. By drip feeding our money we get just 1207 shares worth £108,640. What if we start when the price is high in the cycle? Then we start with a bad deal on our lump sum, which buys just 1091 shares. Drip feeding buys 1205 shares, about the same amount as before. This means drip feeding is worth more £132,560 versus £120,000 for lump sum investing. If the price wobbles and drifts which effect will win? If the size of the wobbles is smaller than the size of the drift then drift wins. The price might look something like this. The lump sum is invested at a bargain price, so it buys more shares (1092) than the drip feed strategy (791 shares) and those are worth more (£249,818 versus £181,420) at the end of the ten year period. A downward drift plus wobble would reverse the situation and drip feed would beat lump sum. 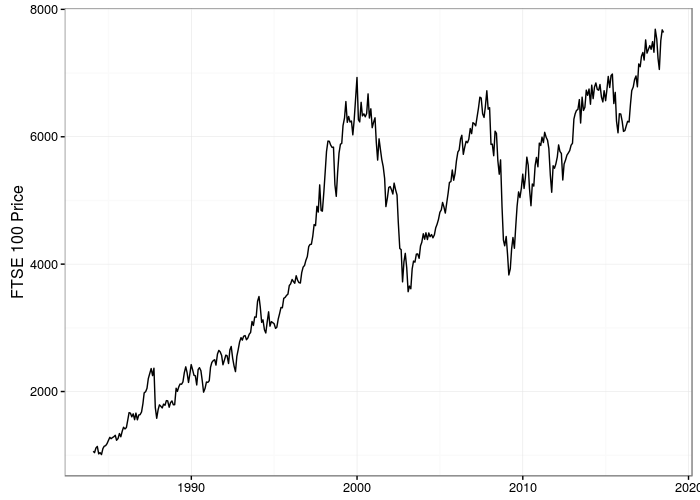 Now that we have a feeling for the type of price movement that best suits lump sum and drip feed investing let's take a look at the price of a real market: the US S&P 500. We have data going back to 1881 for this index, thanks to the economist Robert Shiller. You can see that it most closely resembles our upward drift plus wobble example. This means that over the long term the lump sum case is usually, but not always, better. The longer your investment horizon the more likely the drift will beat the wobble. 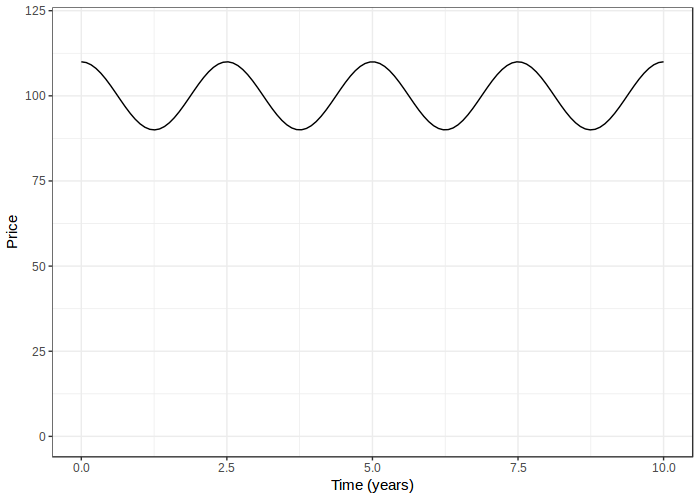 To illustrate the effect of horizon we can count how often each investment period since 1881 gave positive returns which means drift beat wobble. 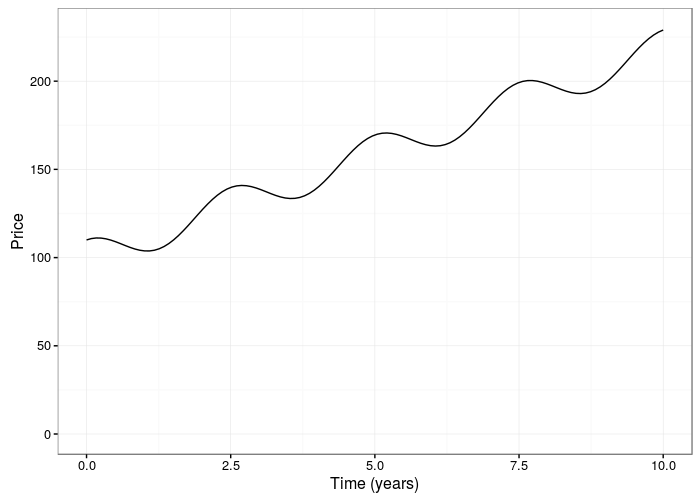 If we compare monthly investment versus lump sum investment over a ten year period for the US market over a ten year horizon it turns out that lump sum investment has a higher return 83% of the time. 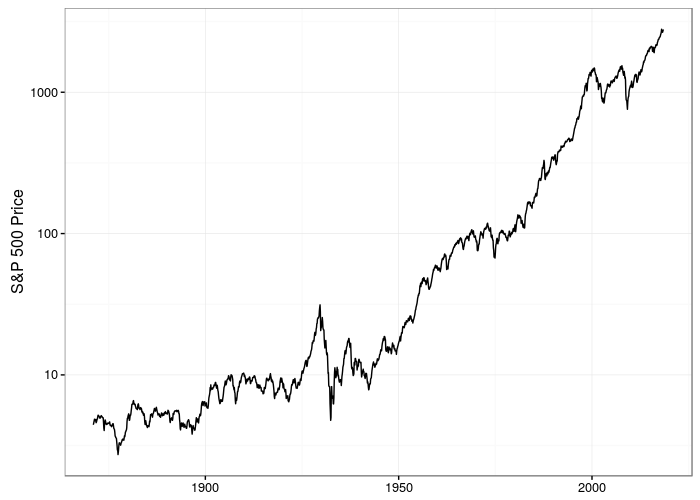 For the FTSE 100 the pattern is similar, although only 34 years of data were available. Unlike the S&P 500 graph above this is not shown on a logarithmic scale. The probabilities for the UK market generating a positive capital gain are 72% over 1 year and 89% over 10 years. Over a ten year horizon for the FTSE 100 lump sum investment was best 64% of the time from 1984 to 2018. The FTSE 100 has not enjoyed such good returns as the S&P 500, particularly after the 2008/9 Global Financial Crisis. The UK had a "lost decade" when stock market returns were negative. This meant that from 2008 to 2011 FTSE 100 investors would have made a capital loss. The US had two lost decade periods since 1881 and these occurred from 1974 to 1979 and 2008 to 2011. We will present their main findings here but if you want to read the full report it is available here with a follow-up report in 2016 with similar findings but fancier graphs. In the 2012 paper Vanguard found that in all three markets lump sum investing performed best about two thirds of the time. Their approach was to either invest a million of local currency into a local 60% equity / 40% bond portfolio and hold that portfolio for a decade or alternatively to drip feed the million into the portfolio over a decade. The result was a remarkably consistent outperformance across the three countries. The paper also reports the size of lump sum investing outperformance. This was an average of 2.3% more for the US, 2.2% more for the UK and 1.3% more for Australia. As well as trying the 60% equity 40% bond portfolio the team from Vanguard tried 100% equity or 100% bond portfolios. This made almost no difference to the result in any of the three countries. The reason for this is that both equity and bond markets tend to trend upwards over the long term which, as we know, favours lump sum investing. While averages provide a nice summary they cover the fact that outcomes are extremely variable. While a bit more challenging to understand the table below is important. The final value of the Lump Sum Investing (LSI) portfolio minus the Dollar Cost Averaging (DCA) portfolio was calculated for each ten-year time period in the data. The "typical" difference is the median or 50th percentile. Half the time the balance was more than this value and half the time it was less. The median was positive for all three countries: $55,151 for the US, £64,904 for the UK and A$42,930 for Australia. Half the time the values lay between the 25th and 75th percentiles so the range between these two values gives an idea of the variability of the difference between the two strategies. This is called the interquartile range. What this means is that, using the UK as an example, typically Lump Sum Investing outperformed Dollar Cost Averaging by 6.4% of the original amount of £1 million. But the uncertainty around this value was 21% of the original amount. A quarter of the time Dollar Cost Averaging outperformed by £36,977 (3.7%) or more. There was a one in twenty chance that Dollar Cost Averaging outperformed by 30% or more. "For investors with a large cash balance on hand, the stakes are high. Out of worry that an investment will quickly lose value, they may gradually ease into the market. Such an approach can minimize feelings of regret by providing short-term, downside protection against a rapid decline in a portfolio’s value." In the 2016 paper which looked at the difference in performance over a 12-month period the difference between lump sum investing (here called Immediate Investing) and drip feeding (Systematic Investing) is shown in this graph. 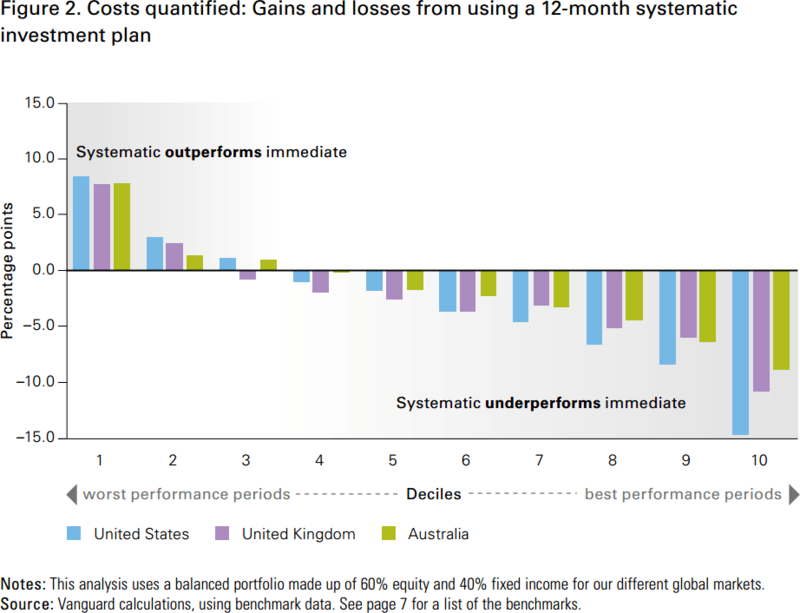 "In deciles 1 and 2 (and 3 for the United States and Australia), the higher returns from a systematic investment plan can be thought of as the payoff from such downside protection." If markets rally however the cost of caution is the underperformance of drip feeding. "The opposite is true in stronger markets. In these cases, the systematic investment’s underperformance can be thought of as the “cost” of such downside protection. These costs may be reasonable if a systematic implementation plan helps an investor overcome any paralyzing fears of regret. The key, of course, is to make sure that the implementation takes place systematically, rather than as a series of separate decisions, each with its own potential for regret. Such an approach imposes the necessary selfcontrol to ensure that the money is fully invested. Abandoning an asset allocation during rough market patches can be incredibly detrimental to the odds of investment success." Investment coach, financial author and founder of PensionCraft. Ramin wants to share his knowledge of how to succeed in long-term investment by keeping fees low, understanding behavioural investment pitfalls, knowing how to read macroeconomic indicators and understanding and controlling risk. Which Is The Best Enhanced Income Fund? Are investments guaranteed by FSCS? Vanguard vs IWeb: Which Is The Cheapest ISA Platform? Learn how to build a diversified portfolio with Vanguard Funds. 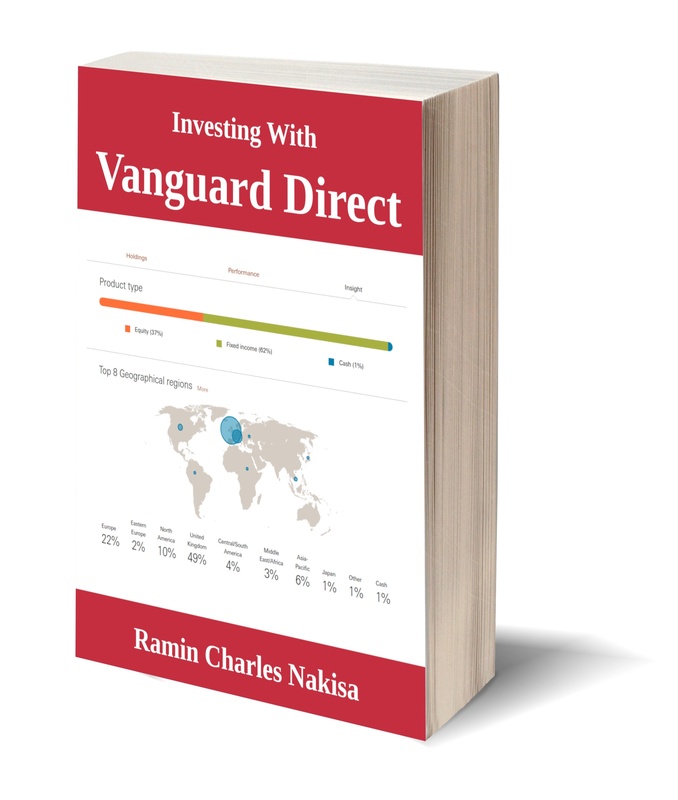 Includes a description of 18 Vanguard ETFs, how to diversify, asset allocation strategies & more. Explain the latest developments in key market-driving economic indicators that are watched by professional investors.